INCLUDED: HHS 2 head hot melt Glue System and New Vertical Buckle Plate not shown. As well as new machinery, Kluge markets and sells equipment in the following formats: Remanufactured, Certified or Used (As-is) condition. Look through the tabs below to learn about which used equipment program is right for you. 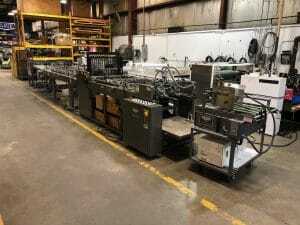 For inquiries about equipment for sale on this page or if you have machinery manufactured by Kluge that you are looking to sell, complete our contact form. All equipment for sale complies with current OSHA and ANSI safety standards. A Kluge product should never be operated without all guarding fully functioning and in place. Please contact Kluge for more information at sales@kluge.biz or 1-800-826-7320 or 1-715-483-3265. 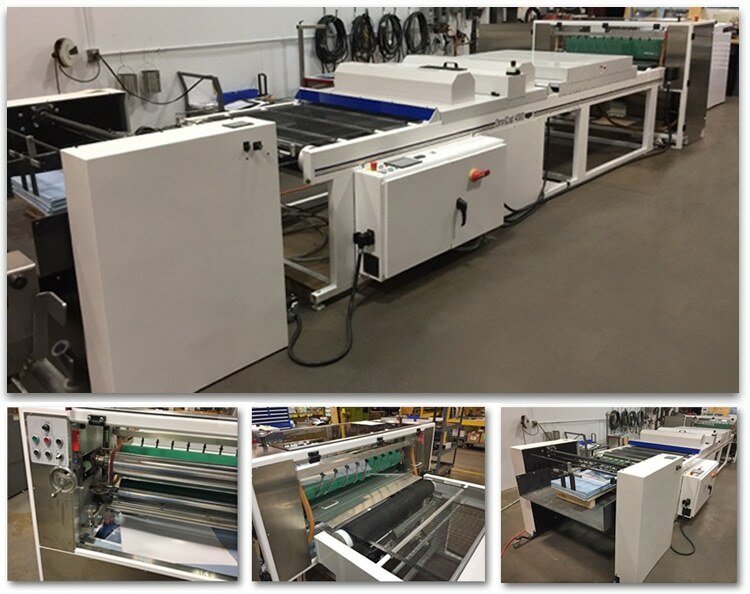 As premier manufacturer of Foil Stamping, Embossing, Diecutting and Folding & Gluing equipment, Kluge understands that the two most important considerations when purchasing any piece of equipment are: Performance and Economy. Does the equipment come with current OSHA and ANSI approved guarding? Can the machine be retrofitted with the correct guards? Does the equipment come with appropriate manuals? Is there a reliable source of parts? Does the purchase price include training and/or installation? Can the machine be inspected prior to shipment? Can the equipment be set up to run a job typical to what you will expect the machine to run? 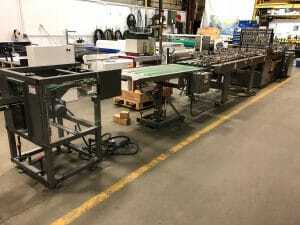 Does the seller of the equipment have references you can call? Proper research prior to making a used equipment purchase goes a long way towards ensuring that the experience is positive. Kluge maintains a complete inventory of parts for all presses that are currently manufactured. For product liability reasons we do not sell parts to machines that were made before 1960. (If there is any question about the age of a press we encourage people to contact us for accurate information). 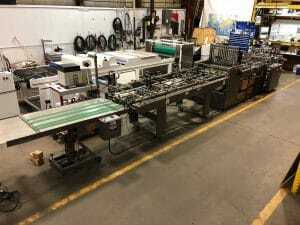 The purchase of a new and or remanufactured Kluge includes installation. Additional operator training is also available. Kluge welcomes visitors to see a press prior to shipment. When purchasing a used press from a source other than Kluge it is a good idea to get the serial number of the actual press you are purchasing and to have the sales agreement specify the press you are getting. Kluge will be happy to demonstrate the press for you or send you samples of work produced on the press. In addition, it is important that you are aware of product liability issues. All Kluge presses, new or remanufactured, are guarded to meet current OSHA and ANSI standards. While these standards are very specific there is one quick question you may ask: if a used press seller states that they meet current standards ask what that standard requires. The standards require that a press operating at 1800 IPH stop within ¼ revolution when the working area of the press is accessed. The press also needs to be capable of being locked and tagged out during maintenance. Again, all new and remanufactured Kluge’s meet today’s standards. 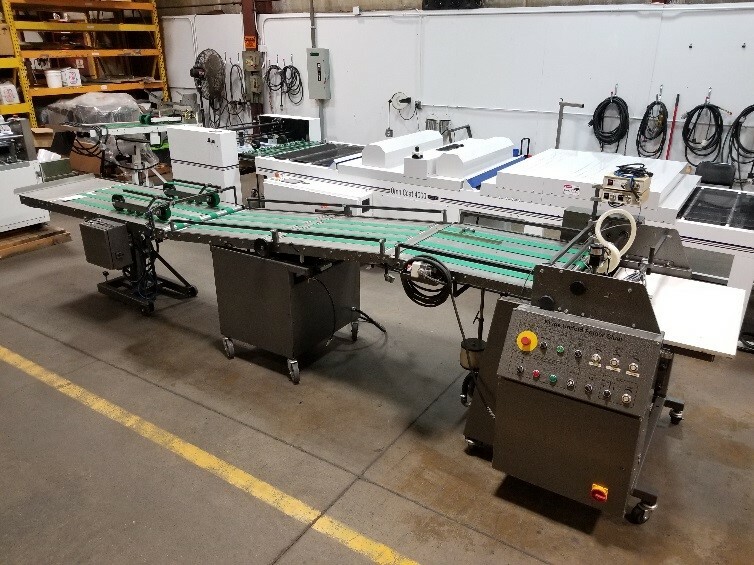 Please contact Kluge Sales for more information on our Remanufactured Folder Gluers at sales@kluge.biz or 1-800-826-7320 or 1-715-483-3265. When you purchase Kluge Certified Pre-Owned equipment, you can rest assured it’s been through a rigorous inspection process. INSPECTED Before it can be part of the certification program, every pre-owned machine is rigorously inspected from top to bottom, inside and out. RENEWED After inspection, renewal service takes place. Broken and damaged components are repaired or replaced, some even upgraded with newer technology. OPERATED After inspection and renewal service, all equipment undergoes operational testing to confirm the equipment is production ready. CERTIFIED Every step of the inspection and renewal processes is performed by a Kluge factory technician. PROTECTED All Kluge Certified Pre-Owned equipment includes a 60 day parts warranty. Brandtjen & Kluge, LLC. can also certify or rebuild your existing Kluge equipment to original manufacturing standards. Contact us for details. Alternatively, why not consider our highly popular remanufactured equipment that includes complete OSHA and ANSI approved guarding, installation, training and 6 month warranty?